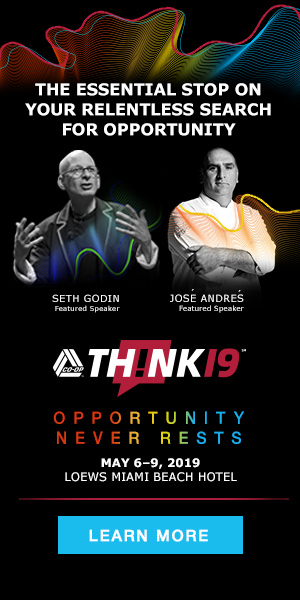 The first speakers announced for THINK 19 in Miami, May 6 to 9, are marketing guru Seth Godin and chef and humanitarian José Andrés. Both are exemplars of turning change and even chaos into opportunity; both offer extraordinary perspectives on the power of human creativity in facing the challenges of the modern world. THINK 19 marks the twelfth annual THINK Conference, unique in the credit union industry for its all-in approach to innovation, leadership and vision. Through a signature mix of keynote presentations, industry-focused “Power Sprints” and once-in-a-lifetime experiences that at past THINK Conferences have included parading down Bourbon Street in New Orleans and hot air ballooning over the Arizona desert. 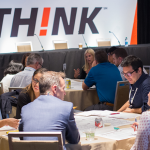 “We’re delighted to bring José Andrés and Seth Godin to the THINK stage,” said Samantha Paxson, CO-OP’s Chief Experience Officer. “Seth Godin quite simply changed the course of marketing. Through his 18 ground-breaking books and his seminal marketing blog, he has influenced a generation of marketers to be more insightful, adaptive and inspired in their work.” As a serial entrepreneur and digital visionary, Godin is a noted thought leader on post-industrial revolution, the way ideas spread, leadership and, most of all, change as a constant catalyst. “José Andrés has been a recognized innovator in the restaurant space for decades,” Paxson continues, “yet his achievements in that realm have been matched by his remarkable humanitarian efforts, which include serving 3.5 million meals to the survivors of Hurricane Maria. This year’s site for THINK 19 is the beautiful Loews Miami Beach Hotel. The full agenda is yet to be unveiled, but the core focus of the conference – bringing the credit union industry’s brightest thinkers and leaders together to learn, network and collaborate – is constant. Early-bird discounts apply through October 31. Interested attendees are encouraged to register now, while early-bird discount pricing is still in play. Rates go up on November 1 and will continue to increase in the months leading up to the conference. Special discounts are also currently available for groups of four or more attendees. Visit co-opthink.org/events/think-19/ to learn more. 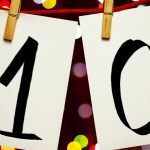 The THINK Conference Turns 10!